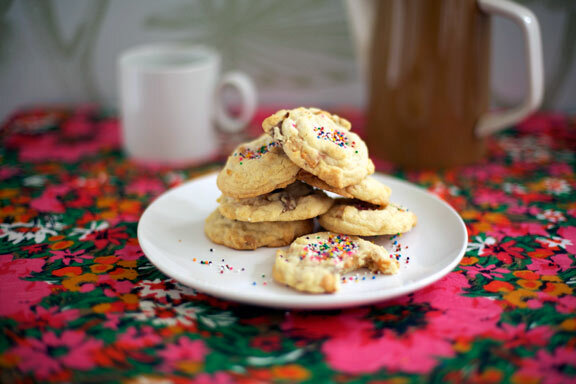 Cookie Problems: Kitchen Sink Cookies + Contest Winner! So here we have some good old Kitchen Sink Cookies. 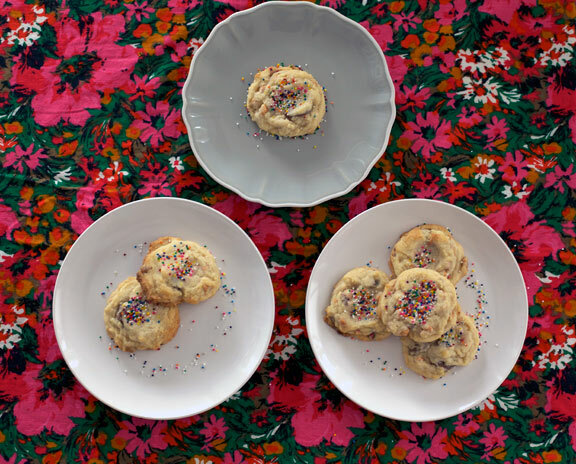 It’s when you have a cookie problem craving that just won’t quit, and you simply MUST make cookies with whatever random ingredients you have in stock. Chocolatey, crunchy, caramel-y, toffee-y. Sprinkles, even. Go for it. Raisins from 2010? Jam ‘em. Toffee bits you bought on sale? Throw ‘er in. Crunchy nuts you use for oatmeal when you’re trying to be healthy? Nut zone. Rainbow sprinkles you bought for last year’s birthday cake? No problemo. Fancy expensive milk chocolate chunks? Oh yes. I didn’t include all of the above ingredients, but you get the gist. Throw the cookie dough together. Just throw it against a wall, practically. Then all you have to do is wait a measly 14 minutes max. Pour yourself a milky tea, get an epi of Orange Is The New Black ready and you will be in cookie couch potato heaven SOOOO soon. a good sprinkling of, well, sprinkles. 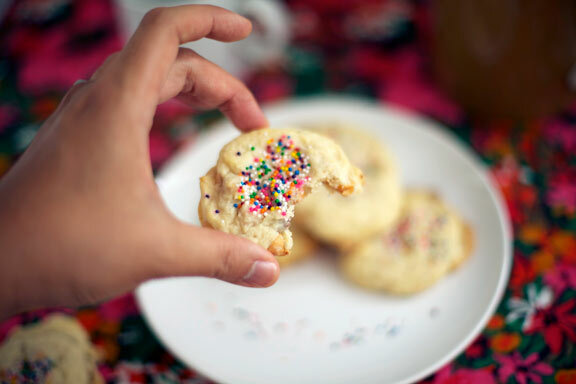 In a stand mixer, beat butter and sugar on high until fluffy. Scrape down the sides of bowl. With mixer on low, add egg and vanilla extract. With mixer on low, add dry ingredients. Throw in the chocolate pieces, butterscotch and peanut butter chips and mix for like, ten seconds until incorporated. 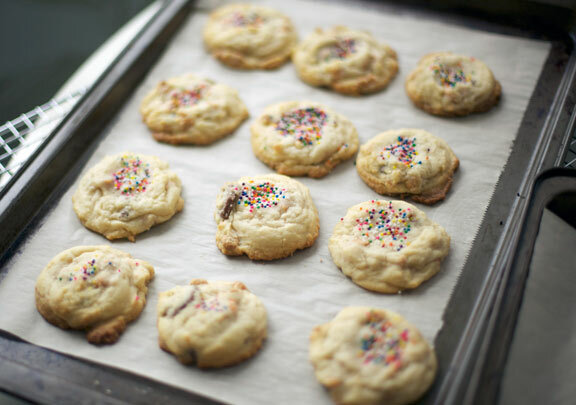 Dole out 1 ½ inch balls of cookie dough onto parchment paper lined baking sheets. 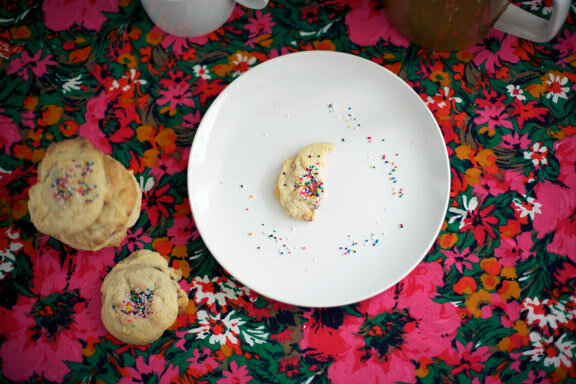 Sprinkle the tops of each cookie. Bake for 11-14 minutes, turning pans halfway. Annnnnnd announcing the delightful WINNERS of my Coco Cake Land 5 Year Blog Anniversary Giveaway – I did a very high tech method of scribbling everyone’s names down on pieces of paper and we drew names out of my kid’s plastic Star Wars bowl. Winners, please send me an email to lyndsay (at) cococake (dot) com to arrange prizes. Thank you to all those who entered – gosh, doing a giveaway was fun! Children’s Party Cakes – Dragon Cake, Cookie Monster Cake, Heart Cake! Molly On The Range: Chocolate Tahini Cake With Tahini Frosting! Woohoo!!!!!! !OMG, WHAT FANTASTIC NEWS to make up for a bad start this morning!!!!!!!!! HAPPY ANNIVERSARY LYNDSAY & HAPPY BELATED FIRST BIRTHDAY TEDDY!!!! These look like they’ll be in tomorrow’s to-do! Yum! ..to won something from my favourite blog ever! @d,b&a – oh awesome!! let me know how it turns out! I’m just staring out as a blogger, do you have and tips or bits of advice please?